This post was written in response to a question posed by the librarians at Boston Public Library, where I’ll be speaking about my book Joy in Every Moment: Mindful Exercises for Waking to the Wonders of Ordinary Life Thursday, January 14, at 6 p.m. as part of the Boston Public Library’s Author Talks Series. Q: What are the 10 Books that Inspire You Most? It wasn’t easy to come up with my “Ten Favorite Books to Inspire You”—but it was fun to give the question some thought. As a writer I have an entire village of favorite books that inspire me on my shelves. (I live in a relatively small space, otherwise I’d have an entire metropolis of favorites!) But which ones might inspire you as well? To narrow it down, I began by flipping through the pages of Joy in Every Moment, my latest book, which includes quotes from many of the books that have inspired me to live my best life—one moment at a time. Then I added a few more to come up with a highlights list that includes books of poetry, philosophy, self-help, psychology, and fiction. I hope you find something here to inspire you! Enjoy. The Life of Pi, by Yann Martel: The fictional character, Piscine Molitor “Pi” Patel, inspired me to “choose the better story”—a reminder I turn to again and again. Man’s Search for Meaning, by Viktor Frankl: A psychiatrist imprisoned in a concentration camp comes away recommitted to his belief that we can live positive and purposeful lives filled with meaning—no matter what the circumstances. Now that inspires me. You Can Heal Your Life, by Louise Hay: As a young woman, this classic self-help book inspired—and empowered—me, to wake up to the role our thoughts play in manifesting our lives. From Where You Dream, by Robert Olen Butler: This book inspires me to grab my pen, nearly as soon as I open my eyes in the morning—and start to write. Tiny Beautiful Things, by Cheryl Strayed: Pearls of wisdom wrapped in humor and humility and delivered with gloves-off, gut-wrenching candor—that’s what I call inspiration. 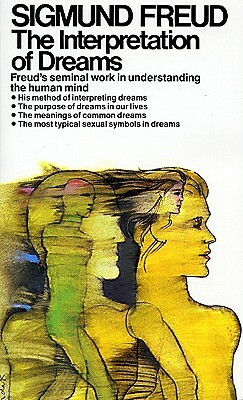 At age 13, I received a gift from my grandfather: several books including a paperback copy of Freud’s Interpretation of Dreams. He gave it to me because he knew how much I loved dreams, but it was too difficult for me—or maybe it just wasn’t saying what I wanted to hear about dreams. I danced around my interest in dreams for decades. Sometimes I’d pay attention to mine and write every one down. Then I’d go through periods of trying to ignore them. After all, no one else I knew was talking about their dreams, and besides, some of my dreams were scary or disturbing. But they were still present, even in their absence. Whereas some people claim they don’t dream in color, I feel I don’t live in color when my dreams are muted. So, eventually I decided I wanted to know more about them. About a decade ago, I gave myself another gift: I ordered Robert Van De Castle’s Our Dreaming Mind from a new age book-of-the-month club. But my life got busy, and the book remained on a shelf for a good five years, maybe more, until my daughter grew up and moved on to college, and I had time to work my way through the encyclopedic tome, chapter by chapter. I then moved on to the works of Moss, Johnson, Jung, and everything else about dreams I could get my hands on. I have since made a bold a commitment to not just learn about dreams but to dive into them. From 2009-2011 I was enrolled in a dream studies certification program, and now I help other people understand the gifts of their dreams. This commitment to dreams, and the time I’ve carved out in my life for studying dreams, working with them, and helping others get in touch with theirs, has been a great gift, for which I am most grateful. Thank you Grandpa, for the gift of your love, and for encouraging me to follow my dreams. RIP Grandpa & Aunt Essie. *Corner View* is a weekly appointment – each Wednesday, where bloggers from all corners of the world share their view on a pre-arranged theme. This week’s theme is “Gifts”. To unwrap the nightly gift of your own dreams, consider giving yourself a time to pay attention to them. Visit my blog atThird House Moon to learn more. The gift of dreams keeps on giving. I said that I was not a Jungian, nor do I think Jung would be one today. What I mean is that whenever we add “-ian” or “-ist” to a word, thus creating a codified school of thought, we lose the vital energy from which the originator’s wisdom flowed. What I most admire about Jung is the courage and audacity he used to delve into the deep strata of his own consciousness, and study his dreams and visions to find meaning. Here’s my philosophy: Have a question about dreams? Ask the dream. Pay attention to your dreams and the ones other people tell you. That’s your primary textbook. In addition, study mythology, religious texts, psychological tomes, and the latest articles about neuroscience and dreaming in scholarly journals. Drawing from personal experience, and being informed by myth, science, psychology, and mysticism is the best approach to dreams I can come up with. From now on one someone asks what school of dreamwork I come from, I think I’ll say I am from the “Yes-And School of Dreaming.” Meaning, I believe in Jungian approaches to dreams, AND Tibetan Buddhist approaches, shamanistic ones, AND Kabbalah-influenced approaches, as well as what neuroscience AND psychology have to offer. Oh, and as for that hawthorn, more on that later. 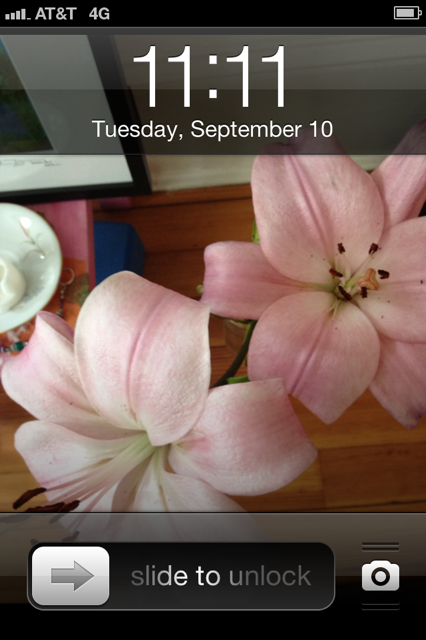 But you might have to remind me to discuss it in a future post, because, well, that’s why I need hawthorn …. In the meantime, if you are local(in the 413 area) and are looking for a wonderful herbal apothecary where you can also buy mugwort and other herbs to help you dream more vividly and remember more dreams … visit Acadia Herbals. Tell them Tzivia sent you. If you’d like to learn more about your dreams, schedule an appointment for dreamwork, purchase a dream journal, or buy a dreamwork gift certificate, visit me at Third House Moon. “Overvalued reason has this in common with political absolutism: under its dominion the individual is pauperized.” –Carl Jung, Memories, Dreams, Reflections, p. 302. Today’s tea is Japanese green tea. I’m drinking it from one of the little blue and white polka dot cups I received as a gift on my first visit to Japan with my sister and her then fiancé, who is Japanese. The warm grassy scent of the tea reminds me of that first visit to Yoshi’s family’s home on a small fishing island on the Inland Sea. 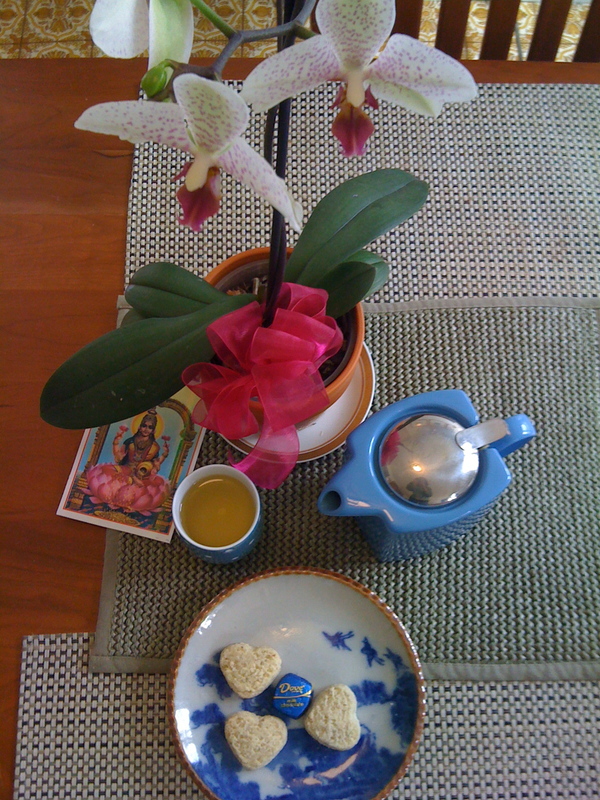 Preparing for this afternoon’s tea break, I put my lemon cookies and Dove chocolate on the blue and white dishes painted with images of Mount Fuji, which my sister, who by then had moved to Japan, gave me as a gift some years back. 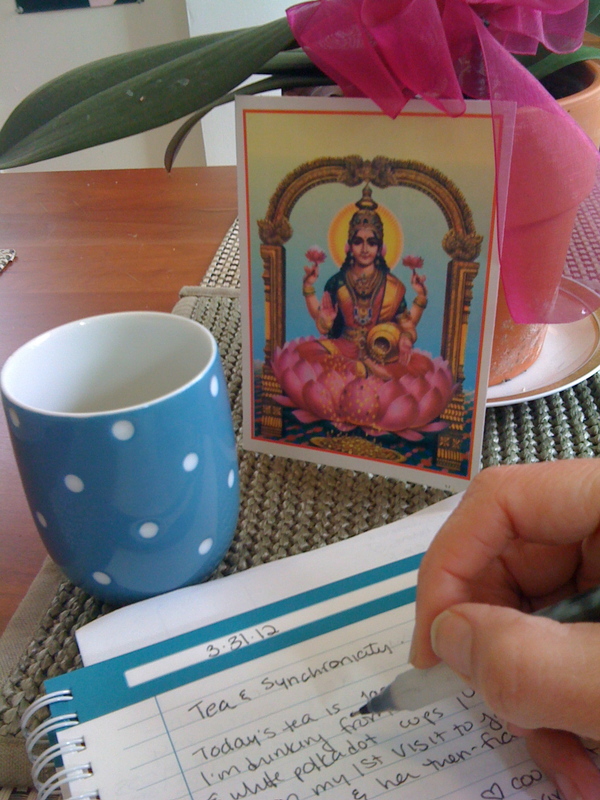 Thinking of my sister I decide to decorate the table with the Lakshmi postcard she sent me, from Japan, this winter for my birthday. Coincidentally, This morning in my yoga class the teacher introduced the theme of giving and receiving abundance, pointing to a tapestry of Lakshmi as a visual aid. In this case, I created a sense of synchronicity*. I consciously set up the echoing symbolism of Japanese tea, memories, and the Hindu goddess that my yoga teacher mentioned, and my sister had sent me an image of. But lately, the synchronicities have been finding me. My dreams for example, have been dropping funny coincidences into my lap, at least once a day for the past week or so. For example, last night I dreamed of a former colleague, whose name, I just realized, is the same as my sister’s. I ran into her this morning at the pricy health food grocery store, where I rarely shop. I’d just gone in to buy a bottle of vitamins, but accidentally turned down the diaper aisle instead. Since my “baby” is fully grown, I had no real business in that aisle. Except that that’s where I ran right into J., who was shopping with her adorable toddler. “I was just thinking of you!” J., exclaimed when our grocery carts nearly collided. “Of course you were,” I said, because these days that’s just how things have been going. Mind you, I can’t recall ever having dreamed of J. before, we haven’t been in touch in well over a year, and have maybe run into each other one other time in the 3 or 4 years since she stopped working in the same school where I still teach. 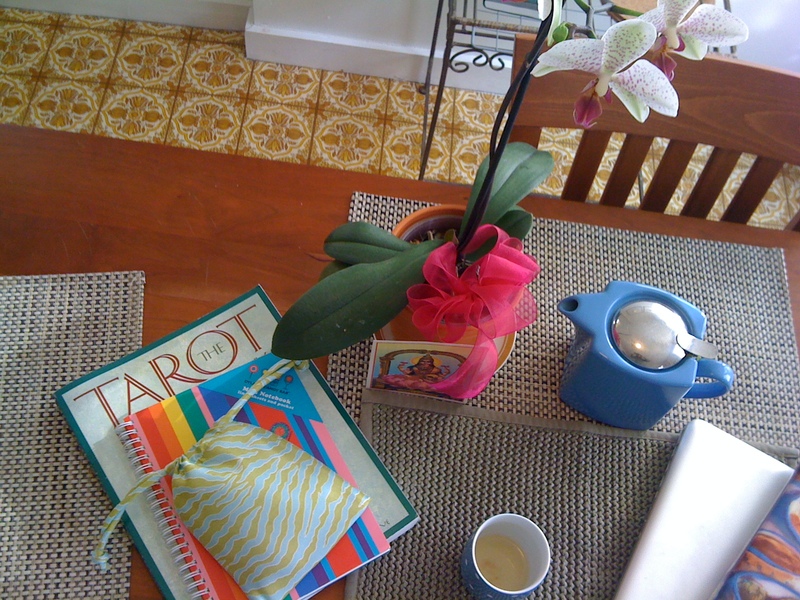 I won’t even mention the next coincidence today, when I jotted down the name of an acquaintance, one who has never before called me, but who … within three minutes of my writing her name on a Post-it because I wanted to invite her and a mutual friend to tea … called me. We haven’t communicated with one another since Thanksgiving, and I don’t believe she’s ever phoned me before. Hmmm. Still, I’m skeptical of such things as synchronicty, precognition and other extraordinary phenomena. But because I experience these things, perhaps too often to consider co-incidental, I have to take pause and consider. I take comfort in the fact that Carl Jung, who was trained as a scientist, believed whole-heartedly in sychronicity. How I would love to sit down to tea with Dr. Jung and talk all of this over. “The collective unconscious is common to all; it is the foundation of what the ancients called the ‘sympathy of all things.’ ” –Carl Jung, Memories, Dreams, Reflections, p. 138. *synchronicity |ˌsi ng krəˈnisitē| noun 1 the simultaneous occurrence of events that appear significantly related but have no discernible causal connection : such synchronicity is quite staggering. ORIGIN 1950s: coined by C. G. Jung. What role do synchronicities have in your life? Is your life made richer by them? It is my tradition each December to reflect on the previous 12 months. Usually, in the last days of the month I make a list of 100 wonderful things about the year that just passed. 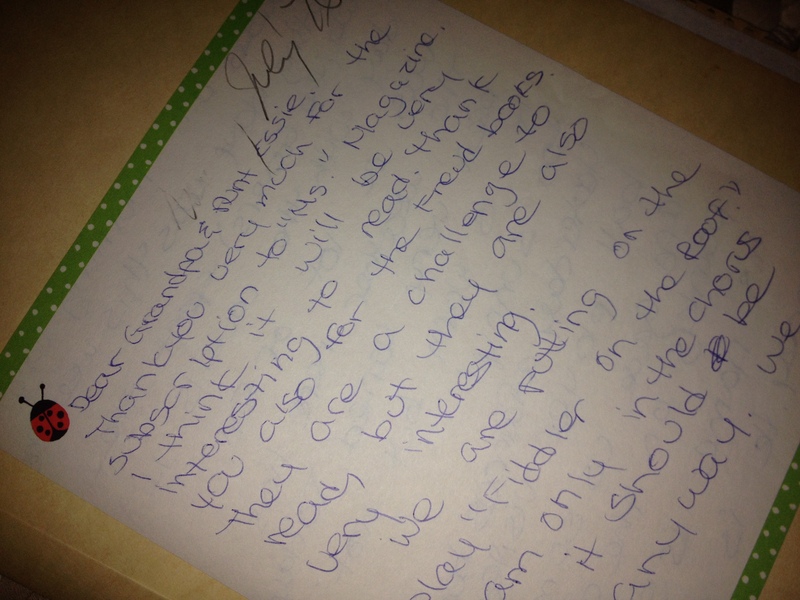 2009 was a particularly interesting year for me; there were so many endings and new beginnings I could hardly keep up. I felt it was a year deserving of something special. It was also the year that Jung’s “Red Book” was published. In the “Red Book,” the result of 16 years of work, Jung illustrates and interacts with images from his subconscious that came to him in the form of dreams and visions. 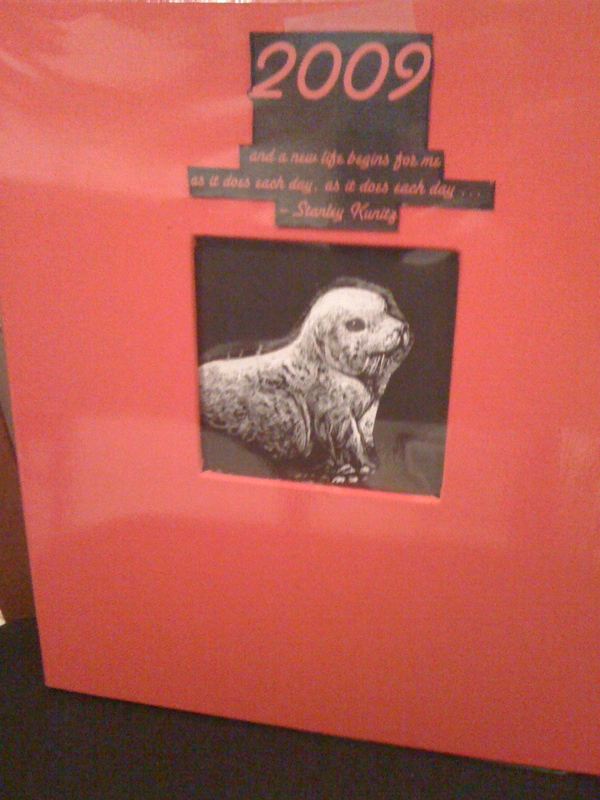 Inspired by the “Red Book” I began what might become a new tradition for me. I created my own book. 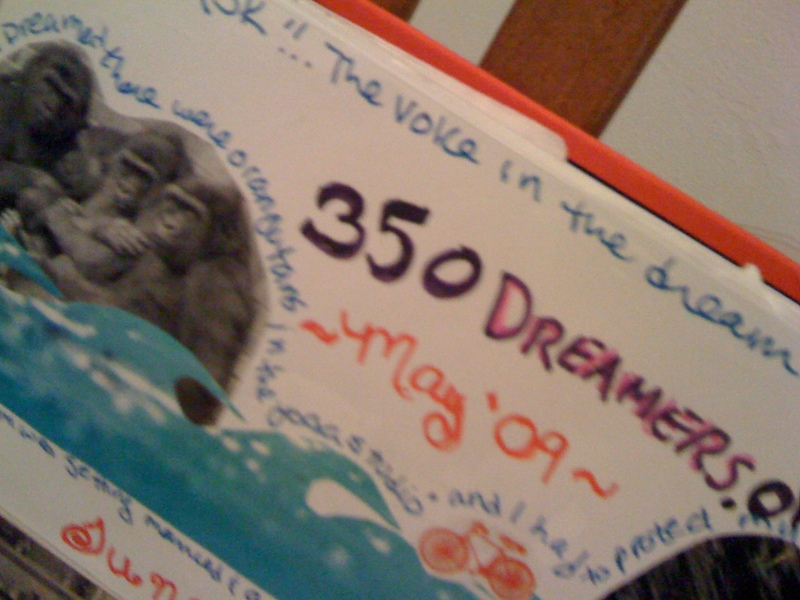 Mine is an album of drawings, collage and writing that reflects my strongest dream images from 2009, along with mementos from the waking events of that year. 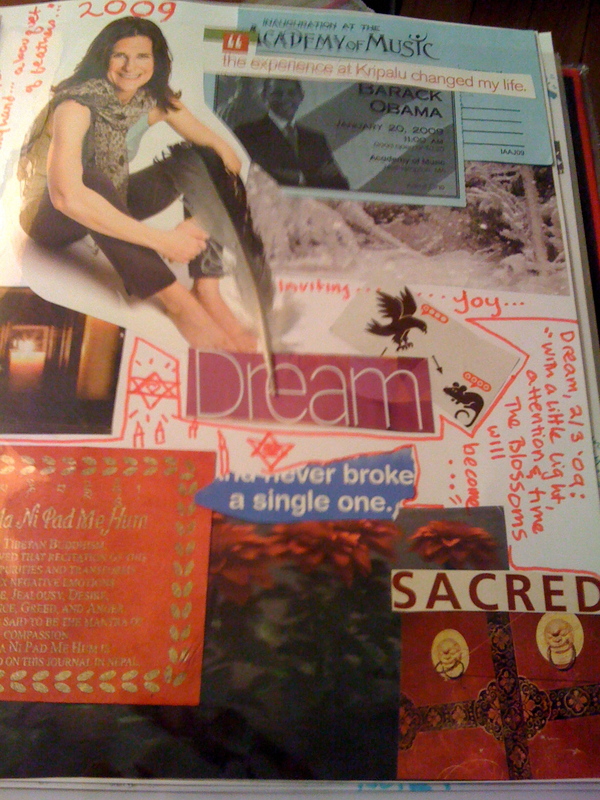 I hope you will consider making a Red Book of your own inner journey for 2010! Perhaps this will become a new tradition that will make your New Years celebrations richer in the years to come!